At the end of last year we decided to redo our kitchen surfaces. We wanted to move house but have decided to wait a while so have given everywhere a fresh new look. Now Christmas is over and everything has calmed down, it's time to finally get some bits and bobs to make it look lovely. 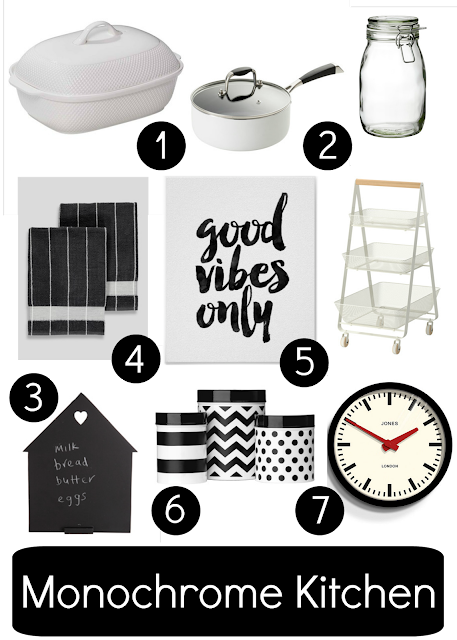 I am opting for a monochrome look and here are some things I've found online that will fit right in. From Harris Scarfe cookware, this dish and saucepan will look gorgeous in the kitchen to cook with. And yeah it may be hard to get rid of the stains but they are so pretty you don't mind. My aim is to have all my tea bags, sugar, flour etc in these amazingly cheap glass jars from Ikea. As our kitchen is quite small, this handy white trolly will be able to hold things in that we need to get to on a day to day basis. Like plastic bags. Oh the glamour! I love a chalkboard in the kitchen. Meant for extremely helpful phrases like "buy milk" it usually ends up being used to say "DO SOME WASHING". Aimed at my husband who will rub it out and get on with his day. From Matalan, these towels will look great chucked over the handle of our cooker. Really reasonably priced I will get a few packs as they are in continuous use in a house full of tiny children. Zazzle is a great site where you can get loads of different phrases. And I loved this one. We eat a lot of meals in our kitchen and they can often descend into fights. So if I had this up? I could point at it and shout "LOOK! BE NICE!". I LOVE these monochrome holders from Wayfair. They would look fantastic alongside the Ikea jars. They would stand out so well on our new white surfaces and would be ideal to keep anything in from pasta to my Mum's posh fruit teas. From Jones, but sold in Debenhams, this clock would look gorgeous on the wall in our kitchen. I am permanently late for the school run so with this around there would be no excuses!